Lynden Park Mall is proud to partner with Hoarding for Humanity, who uses an environmentally friendly approach to the hoarding process and all materials are given a second life to positively impact our environment. Hoarding for Humanity partners with the renowned Habitat for Humanity Canada offering clients a whole-hearted and well-rounded recycling program with guaranteed, sustainable accountability. 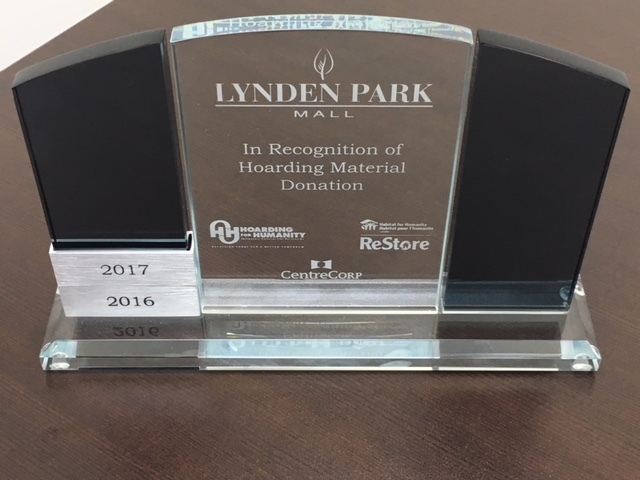 For the second year in a row, Lynden Park Mall has obtained the award for recognition of hoarding material donation.